Litron was formed in 1997 and pioneered commercial photodiode energy monitors while developing a technology base for manufacturing solid state lasers. Litron’s first laser products were launched in 2002 and these have developed into a set of standard models and configurations including dedicated PIV systems and high energy pulsed lasers. With an installed base of over a thousand units the design and manufacturing integrity of our products is truly field proven. 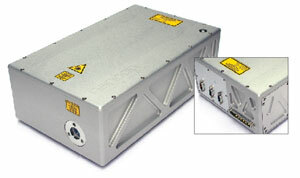 Litron Lasers manufacture pulsed and CW Nd:YAG and Nd:YLF lasers. All its lasers are designed and manufactured by Litron in Rugby, England. A family of compact and rugged Q-switched lasers suited to a multitude of applications including mask repair, LIBS, LIDAR, PIV, pump sources and spectroscopy. The Nano series of pulsed Q-switched Nd:YAG lasers have been designed to satisfy the demands of customers today. With industry leading performance in every respect, and unsurpassed design and build quality, the Nano series sets the new benchmark for laser systems today. At the heart of all lasers in the Nano range is a robust monolithic resonator machined from a solid piece of aluminium leading to a solid and stable platform on which the systems are built. Ultra-stable mirror mounts, a stainless steel pumping chamber with close coupled ceramic reflectors, and proprietary long-life flashlamps result in homogeneous, stable outputs. The choice of resonators available again sets the range apart, as standard we offer stable (Nano O, Nano S, Nano L), telescopic (Nano T, Nano TRL) or Gaussian-coupled unstable resonators (Nano SG, Nano LG, Nano TRL). For more information and a detailed description of the types of resonators please view the technical information page. Accessories such as harmonic generators and variable attenuators are added as modular ‘bolt-on’ attachments and can be added and removed as required. All harmonics to the fifth (213nm) are available as standard, either individually or mixed. All lasers in the range are supplied with fully integrated power supply and cooler units with no need for external water (except some Nano TRL models). All power supplies have a full interlock suite making setup and fault diagnosis easy. An industry standard TTL interface allows external control of both the flashlamp and Q-switch. Other system controls are accessible via the supplied system remote controller or RS232. When running with RS232 a full software suite, dll and byte code documentation is provided. See how rugged these lasers are, watch the video below! Superior performance through superior design. The modular design of the laser head allows a wide variety of resonator configurations to be offered, from single rod oscillators to fully birefringence compensating twin-rod-oscillator, twin-rod-amplifier systems. Furthermore, a choice of stable, stable-telescopic or unstable Gaussian-coupled resonators is available, allowing the customer to specify a system that suits their requirements. The LPY range is comprised of three series, the LPY600, LPY700 and LPY7000 series. All utilise the same robust invar stabilised, modular construction, the differences being in the resonator and amplifier topologies. The LPY600 lasers are oscillators or oscillator amplifier systems with a single rod in the oscillator or amplifier. These are predominantly used for low (up to 30Hz) repetition rates and moderate power outputs. The LPY700 lasers are oscillators and oscillator amplifiers that use a twin-rod architecture in both the oscillator and amplifier to effectively compensate for the thermally induce strain birefringence in the laser rods. Such a method leads to very high beam homogeneity (especially in the harmonic wavelengths) at high power throughputs. This allows the LPY700 series to run at up to 200Hz with high energy outputs and extremely uniform beam profiles. The LPY7000 lasers are ultra high output energy systems that give outputs of up to 3.5J per pulse. All LPY lasers can be fitted with an optional injection seeder to give SLM outputs. Energies of up to 3.5J and repetition rates of up to 200Hz are standard. Applications include Dye laser pumping, OPO pumping, Spectroscopy, LIBS, LIDAR, PIV and many more. Litron offers an extensive range of flashlamp pumped and diode pumped PIV laser systems with output energies of up to 1J per pulse and repetition rates of up to 200Hz. The range of PIV systems is based around both the ultra-compact Nano series and the larger invar stabilised LPY series. The overriding factor that sets Litron’s products apart is quality. This is evidenced not only in the design and construction of the product, but also in its performance. In any imaging application the beam quality is of paramount importance as this completely determines the light sheet quality. By choosing a suitable resonator configuration the output beam quality can be controlled to give a very smooth spatial profile which remains homogeneous as it propagates right into the far field. Such resonators are almost always of a stable or stable-telescopic configuration. Unstable Gaussian-coupled resonators are not in general ideal for visualisation applications. Such resonators yield output beams that contain very high spatial frequencies in the near field, and as they propagate a hole appears in the centre of the beam (a ‘donut’ beam profile). This is typical of any such resonator and is a result of the physics of the system. It is therefore quite clear that if the beam is to be used in the near or intermediate fields(within 10metres of the laser output) the light sheet formed is unlikely to be uniform, as the laser beam is not. It is our philosophy to provide a laser system that suits an application. A ‘one system fits all’ approach, as offered by most manufacturers, does not allow the customer to optimise their process. For applications such as PIV Litron has developed resonators that will yield extremely uniform lightsheets whose pulse to pulse structure remains extremely constant. These are all based around our stable or stable- telescopic resonators. Single wavelength output laser system operating at 100Hz or 200Hz. Harmonic generation modules for 532nm, 355nm, 266 or 213nm with dichroic separation. Multiple wavelength (1064nm, 532nm, 355nm and 266nm on same axis) output laser system operating at 100Hz or 200Hz. Dedicated design for FPD and multi-wavelength micro-milling and laser processing workstations. Compact aluminium monolithic laser head – rugged and sealed from contamination. Diode pumped Nd:YAG laser – reliable and stable with no consumables. Air cooled – no water, low maintenance and simple integration. EO Q-switched – accurate ultra short pulses and high peak energy. Microprocessor controlled – continuous monitoring and status feedback. Integrated electronics and Q-switch driver – 2U Control and DC power tray. Sealed harmonics – 532nm, 355nm, 266nm and 213nm options. Easy control – touchscreen or PC based user interfaces. Litron produces a range of high power CW and Q-switched CW diode pumped lasers for a variety of applications. These are based around both Nd:YAG and Nd:YLF. The LDY300 and LDY350 lasers are intra-cavity doubled Nd:YLF lasers offering outputs of up to 22.5mJ per pulse at 1kHz, 527nm. The LDY310 lasers are Q-switched Nd:YLF lasers offering outputs of up to 30mJ per pulse at 1kHz at 1053nm. The LDY10-60 series are side pumped Nd:YAG laser systems designed for applications such as laser marking. All systems are constructed on our self supporting invar stabilised rail ensuring reliable industrial performance. Ultra-stable optical mounts and a sealed beam path ensure that the systems perform even in harsh environments. All systems are controlled via an LCD interface or through RS232 for which full software support is provided. Litron’s flexible approach and expertise in laser design means custom build lasers are a natural part our production. In addition to its standard range, Litron produces a great variety of custom systems, both based on standard modules and, where necessary, offers a complete design to fit your needs. The high degree of modularity in the design of Litron’s lasers, both mechanical and electrical, yields a platform ideally suited to non-standard bespoke systems. Mechanically the invar rail structure and associated optical and mechanical mounts form a set of components whose placement within the rail are largely variable. Due to this almost any optical configuration can be achieved with absolutely standard components. This is a significant advantage when adapting an existing design to a specific requirement or when producing an entirely new type of system. In addition to standard parts Litron owns a engineering company that runs CNC mills and CNC lathes. Such a facility allows rapid prototyping and production engineering of mechanical parts allowing even the most bespoke of systems to be produced and delivered rapidly. Litron designs and manufactures all of the electronics within its lasers. As a result a large portfolio of standard parts are available from capacitor chargers to CW diode drivers. This again is extremely advantageous to producing custom systems in a cost effective and timely manner. Contact Us to discuss your custom laser needs.